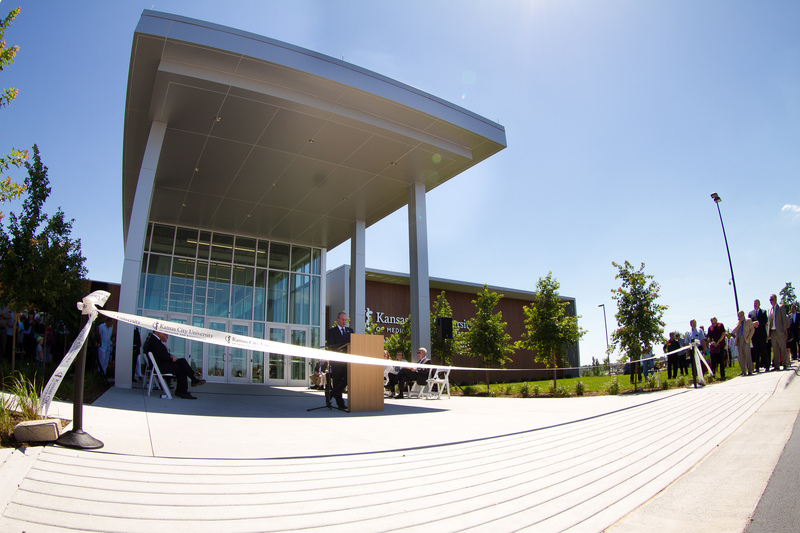 The word of the day was “historic” as a grand opening and ribbon-cutting ceremony was held Tuesday, June 6, for the new Kansas City University of Medicine and Biosciences campus in Joplin. “What an amazing turnout for this historic day,” said Dr. Marc Hahn, president and chief executive officer of KCU in his remarks to the crowd gathered outside the KCU Farber-McIntire campus. “We’re opening the first new medical school in Missouri in almost half a century. Missouri Southern will play an important role in this new era, partnering with KCU for the exclusive Yours to Lose – Advanced Medical School Acceptance Program. The one-of-a-kind program allows a cohort of Missouri Southern students to be admitted to KCU’s new Joplin medical school at the same time they are accepted to MSSU. Missouri Southern recently announced its first cohort of students, which will launch at the start of the Fall 2017 semester. “It’s a very unique program in this country,” said Rob O’Brian, president of the Joplin Area Chamber of Commerce, adding that he hoped that as physicians graduate from the program, they’ll call Joplin home. In congratulating KCU on the grand opening, Missouri Southern President Dr. Alan Marble called the new medical school a “game changer” for the region and MSSU. “We are committed to working side-by-side with them to identify and develop future generations of physicians who will continue to strengthen Joplin’s stature as the health-care epicenter of the Four State Area,” he said.